Here is my last Father's Day card that I made for the All Occasions swap for convention. 116 cards all together & you have no idea how happy I am about finishing this!!! Now my focus will be on my Wow cards. I know what type of folds I'll be doing so look out for those samples over the next week or so....I'll be making my scrapbook pages as well as my mini albums but not sure if I'll take pics of those or not---they NEVER come out right LOL!!! good golly! 116 cards!!! yikes! however, this is stunning. like the color combo and i love that emboss folder! How perfect for Fathers Day! I love your colors, such gorgeous contrast! Love the texture and the color combo rocks! So glad you joined us for our Here Comes the Boys challenge at The Crafting Cafe! Beautiful card! Thanks so much for playing along at CCCB! This is so super cute, I love it. Thanks for playing with us over at Loves Rubberstamps!!! What a wonderful and unique card. The colour combination is lovely and I really like the boot and the sentiment. The embossed pannel looks really lovely and is very deep and crisp. I really hope to see many more entries from you in our future monthly challenges on our challenge blog. Fantastic digi images from LEJ Designs up for grabs and other stuff from our amazing sponsors! p.s. we are currently having a DT call, please see our 'sticky post' on the blog for more details. Love it! Thanks for playing at The Crafting Cafe in our Here Come The Boys Challenge! My goodness, you have been quite busy, and sounds like you will be for a while!! Love the chalkboard technique on this! What a fabulous card this is..Thanks for playing along with us at CCCB! Another great card and love all the techniques you used. thanks for joining us again at LRS. Love the CAS look! Great color combination. Such a fun card! :) Thanks for playing with us at CAS on Sunday! Loving this, Jackie! Great boot image. :-D I'm really happy that you played along and want to say "thanks so much" for joining us in our "Masculine" theme challenge at Tuesday Throwdown this week. Thanks for sharing at Crafty Sentiments this week. Fabulous card! Hiiiiiha cowboy! 116 cards... goodness me! Awesome card, Miss Lady!!! Thanks for playing along with us at CAS on Sunday!! Love that card! Especially the embossing! Have to get that folder! 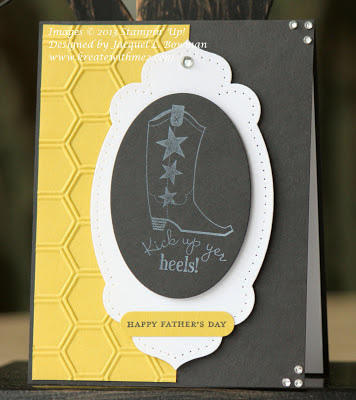 Thanks for sharing over at Cuttin and Stampin. What a fun masculine card! What a great card! I can't imagine making that many.